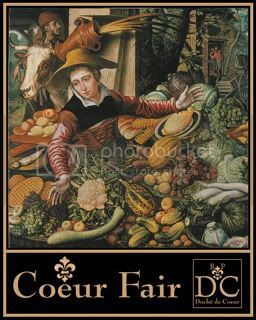 The Duchy hosts a quarterly fair (Spring, Summer, Fall, Winter) at the Coeur Fairgrounds. This is an opportunity to meet & mingle with your fellows and have an all-around good time in a relaxed, country atmosphere. The use of the RPS Role-Play system is encouraged (but not necessary) to take full advantage of this event. Find out more at Duch de Coeur - RPS Getting Started. The next fair is slated forJuly 8thto 10th. Set up begins 6am on Friday. Take down 6pm Sunday. A schedule of event times will be posted so that you know when you are most likely to meet people there. Each participant will be limited to 50 prims though exceptions may be granted (contact me to arrange formore prims). You will be assigned a specifc area for your set up. Merchants - selling goods for RP$. You can do this a number of ways including the use of RP$ Vendors (contact me for more information) or by actually being present and selling the items directly. Bartering & trading is encouraged. Any item applicable to the time period is welcome including, food, herbs, flowers, art, healing potions, furniture etc. There will not be a charge for these merchants. Merchants - selling RPS Compatible goods for L$. Spaces are limited and there is a L$5/prim fee to participate (minimum of 10 prims). Merchants - selling goods for L$. Spaces are limited and there is a L$5/prim fee to participate (minimum of 10 prims). All merchants are encouraged to be present on the Sunday from 12pm to 2pm SLT at a minimum. Services - earning RP$. It would be great to have people both performing & offering different services: healing, fortune telling, musicians, magicians, jugglers, kissing booth (PG kisses only ) Please use your imagination! The times for these will be advertised as individual events. Contact TatianaDokuchic Varriale (here or inworld) for more information, to reserve your spot and/or to schedule an event time.